When it comes to desktop calendar software on the PC, there is little argument that the big dog in the park is Microsoft Outlook. However, while Outlook comes with a hefty feature set, it also comes with a hefty price tag—more than most people would want to pay to schedule their time. 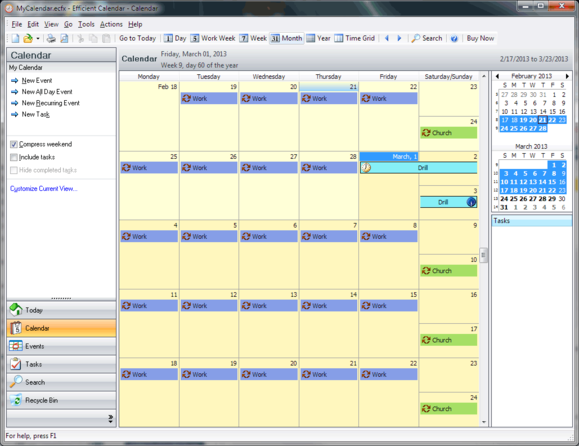 Efficient Calendar takes the core calendar functions of Outlook into a standalone desktop application at a small fraction of the price. The Calendar view shows your upcoming events at a glance. Calendar events are very easy to create. 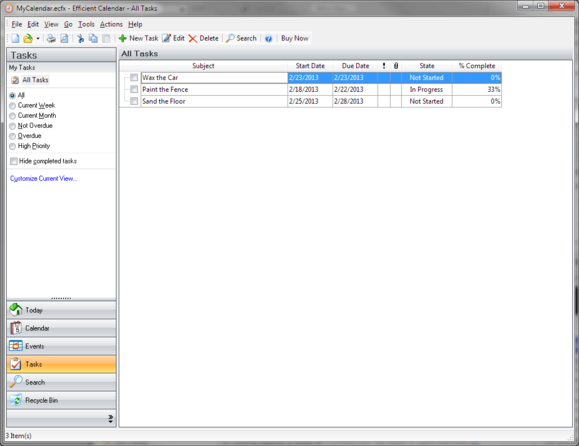 You can specify the start and end times, control recurrence, assign a color-coded label, and attach or link documents. Comments can be entered in a full rich-text editor, and the labels can be easily customized if the provided default labels are not to your liking. Similarly, the Tasks function is very robust—perhaps overkill for people just looking for a basic to-do checklist. You can set start and due dates, assign a status (such as "not started" or "on hold"), and specify how complete you feel the task is as a percentage. Tasks also have labels, attachments, recurrence settings, and rich-text comments like calendar events do. The Tasks view shows the status of your currently active tasks. The Achilles heel of Efficient Calendar comes down to data portability. As an Outlook substitute, Efficient Calendar can import and export Outlook-compatible CSV files. 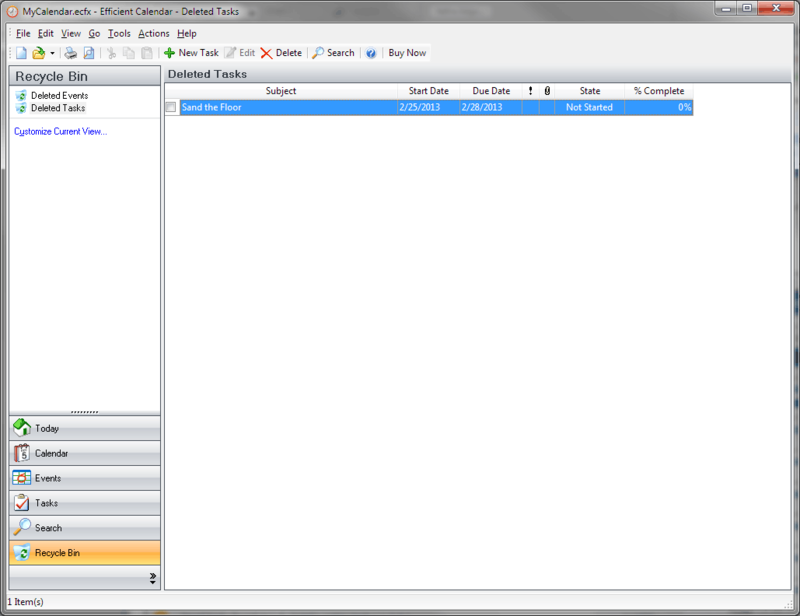 However, it does not import or export the much more common iCalendar format (*.ics) used by Google, Hotmail, Yahoo!, Apple, and a litany of others. It does not sync with any cloud calendar providers, which is great if you are anti-cloud but not so great if you need your calendar on your Android, Blackberry, or iPhone. Efficient Calendar does, however, have a server solution that lets you share a calendar with mutliple users. The server itself is free, while the Network edition costs more to license than the Personal edition does. If a Task or Calendar event is deleted, it gets moved to the Recycle Bin. For the people who don't need (or don't want) their calendar on their mobile devices or on the Internet, Efficient Calendar is a great buy. For everyone else, the 30-day trial is fully functional and should give you an idea if the limitations are something you can live with or not. Efficient Calendar is a solid calendar application that will keep your schedule out of the cloud, but it will also keep it out of most other calendar software.